Want to decorate for fall but running out of time? These five pieces make for easy fall decorating. I’m letting you all in on my secrets for easy fall decorating today and spoiler, it involves throwing a lot of pumpkins onto different surfaces in your house. That’s about as far as I got in fall decorating this year, and I already packed the other fall decor away in the basement till next year. Sometimes simple and easy is best. I’m joining my friend Jess from Bright Green Door and several other bloggers today to share all sorts of fall decorating ideas as part of the Hello Fall home tour series, so be sure to check out the other ladies’ blog posts linked below. If you’re stopping over from one of the other girls’ blog posts, welcome! I’m so glad you found me. I love decorating, painting furniture and adding pops of green. 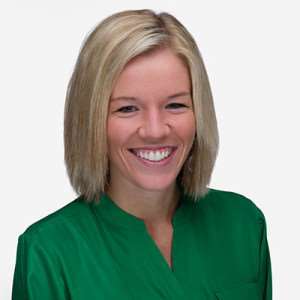 You can learn more about me here. This little mudroom is quickly becoming one of my favorite spots in the house. Which is kind of funny since it’s basically just a blank wall in our kitchen that I turned into a mudroom so we have an easy drop zone for shoes, coats, keys and some of Oakley’s stuff. I swapped out one of our everyday pillows with this pillow cover. Seasonal pillow covers are even easier to store than seasonal pillows, not that I don’t collect those, too! Pillows in general are just so easy to swap out each season. If you’re looking for more fall pillows, check out this post where I rounded up 25 affordable fall pillows. I love using scarves as decor because hello, easy. I threw this fall scarf blanket (available here when it’s back in stock) on the bench annnnnd instant fall in here. Sorry (not sorry) in advance for giving you all the link to that scarf. When I found it last year, I promptly bought three scarves because I just couldn’t pick. Their choices are awesome – happy shopping. I added some pumpkins to our mantel and this fun metal basket for some fall flair, too. I shared it on the blog a few weeks ago. If you missed it, you can see more of our coastal fall mantel here. I love that this is a mix of green and yellow, because I can’t get enough green! Plop some wheat grass on a tray or in a vase, and again, instant fall. Or a letterboard if you have one of those! This is on the wall right outside of our bathroom and kitchen so I like to keep a fun quote on here since we walk by it so often. I share my secret for getting perfect chalkboard letters here. It’s sooo easy. If you want a copy of the “We love fall most of all” template I used to draw out the message on this chalkboard, you can download it to use for a fun fall chalkboard of your own. What are your easy fall decorating ideas? Do you go all out each season, keep it simple or are you somewhere in between? Or see even more fall ideas on my fall decorating page. 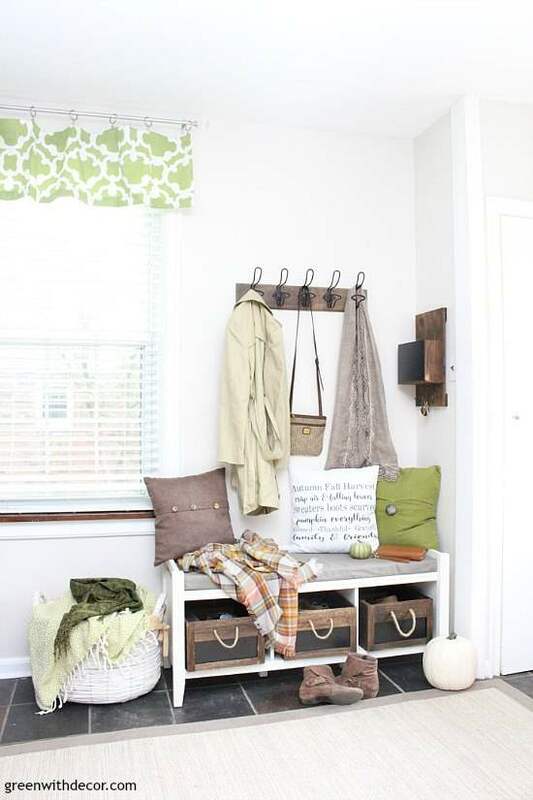 These are great tips Meg and I love your mudroom decor!! It’s so fresh and cozy. Thanks, Kathy! I’m so happy with how the mudroom turned out! Great tips! I was all about small changes this year too and it’s amazing what a big difference they can make! 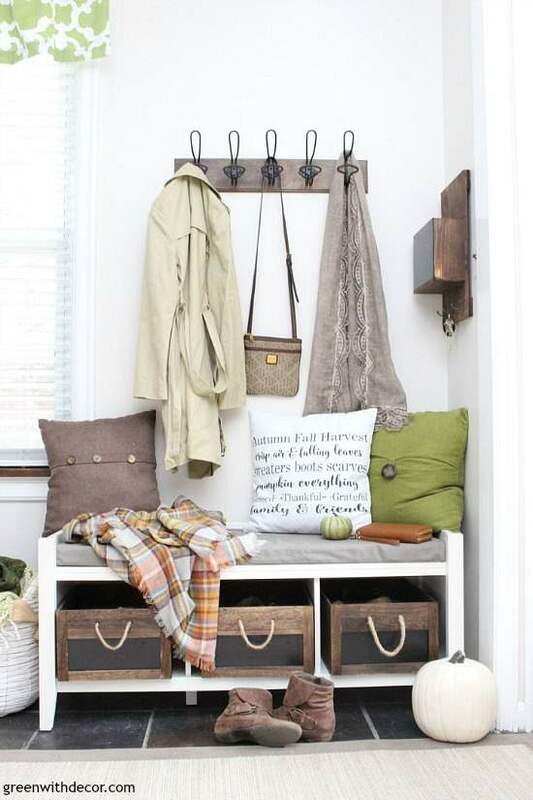 I love how your mudroom space came together. . Thanks, Melissa! I love small changes! What great tips! I followed your scarf tip without even thinking about it. I just love the coziness a scarf brings! Thanks for joining in. So glad we could do the tour together! Thanks, Jess! The scarf tip is so easy! Thanks for organizing such a great tour! 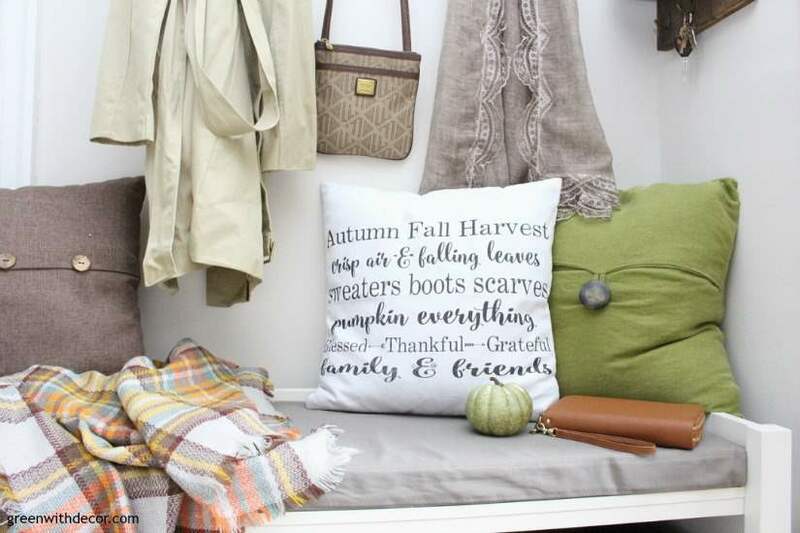 Great tips for fall decorating! I loved all your pumpkins and pops of green. So beautiful!